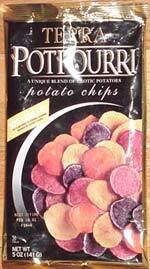 Taste test: This bag contains an assortment of chips from various kinds of potatoes, some of them quite unusual. Each one is available separately from Terra in its own separate bag, including Blues, Sweet Potato Chips, Yukon Gold and Red Thumb potatoes. Combining them in one bag was a good idea, and these are tasty and interesting to eat. It's nice to have variety within a bag. The one possible downside is the sweet potato chips, which are a bit gamey and don't have the same kind of crunch as the other kinds in this bag. Mixing tastes in the same bag works, but mixing textures does not. Smell test: Kind of oily. This snack was discovered by Jeremy at Whole Foods Market (formerly Bread & Circus).